The vision of the newly elected President of the Muslim Judicial Council (SA), Shaykh Irfaan Abrahams is his dedicated focus on taking the MJC to the people by strengthening ties with the community through regular communications via the 5 Imamat Council meetings, the various community service projects, educational programs and most importantly through dedicated service towards dawah. Within days of him being elected, the President visited Islamic tertiary school, prisons, Imamat Councils of Northern/Southern Suburb and Mitchell Plain, Youth Groups, township Ulama, Foreign delegations and community leaders as well as giving attention to the recent community crisis in Malibu. The President, Shaykh Irafaan Abrahams accompanied by Maulana Bienjamien Osman of the MJC`s Department of Conciliation, Mediation and Arbitration met with community leaders from Malibu Village on Monday, 23 May 2016 to assist in the establishment of a place for worship. 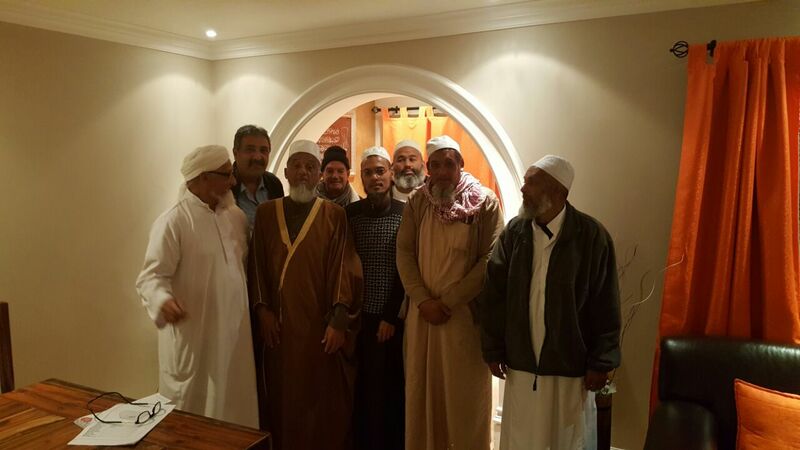 The meeting between the MJC(SA) and the Malibu Village Muslim Community leaders is not a new development. Prior to demolition, Sh Irfaan Abrahams met with members of the community to advizethem on what the requirements would be to prevent the demolition from taking place. The community was however not able to produce the title deeds of the erf. Shaykh Irfaan informed the community that ownership would need to be proved and also advised the community to ensure that they are given a court order prior to demolition. We are confident that if correct procedures are followed and that the community works with the MJC on this matter a positive outcome will be reached. The MJC is concerned with the shortage of places of religious instruction available to the community living in the Malibu area of Blue Downs. Sh Irfaan also noted that many churches have been established in the Malibu Village area with no masjid to accommodate the growing number of Muslims in the area. Meanwhile, the MJC is it contact with the Property Management Department of theCity of Cape Town who will assess the situation and provide the Malibu community with alternative solutions towards establishing a Masjid if needed. The MJC has committed itself to assist the community in realising their vision for a place of worship to be established in Malibu Village. A meeting between the Malibu Mosque Committee, the CofCT and the MJC will be taking place on Monday, 30 May 2016.